Every since I was a kid, I have been a fan of Rice Krispy Treats and still treat myself to them on a fairly regular basis at home. These days, I usually get a little more creative with the cereals and mix ins that I use, giving my cereal bars a twist that is a little more grown up or a little more fun. I particularly enjoy making cereal bars around the holidays – like Halloween – when there are a lot of seasonal cereals out to make my treats even more exciting. These Reese’s Spiced Peanut Butter Bats Cereal Bars are made with the seasonal Reese’s Puffs Peanut Butter Bats Cereal (that’s a mouthful!) and have an extra dose of peanut butter and a hint of spice in them, so they have a perfect-for-Halloween look and loads of flavor. Reese’s Puffs are pretty candy-like as cereals go – and that’s not necessarily a bad thing, because they make an amazing snack, even if they’re not necessarily my first pick in the morning for breakfast. The holiday version has chocolate and peanut butter bats in the mix, giving them a slightly spooky look. The cereal has a fun peanut butter flavor and a hint of chocolate, so any chocolate + peanut butter fan should enjoy it. 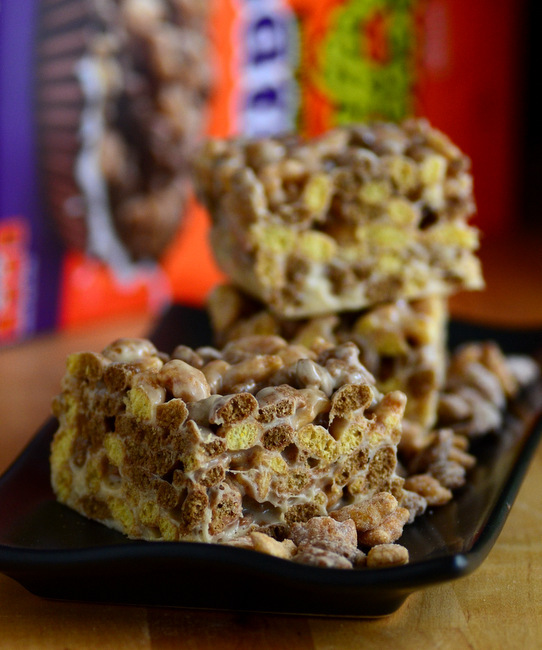 If you don’t have the seasonal cereal, you can use regular Reese’s Puffs in this recipe. The recipe starts out like so many cereal bars, but adds a generous amount of peanut butter in with the melted butter and marshmallows that give the bars their structure. I also added pinches of cinnamon and salt, since a touch of spice sets off the peanut butter nicely and the salt contrasts well with the peanut butter. When mixing in the cinnamon, toss it with the cereal first. Ground cinnamon will actually stick to the cereal fairly well on its own, and it may clump up if added directly to the marshmallow mix. I spread the finished cereal bar mixture into a 9×9-inch square pan because I like a taller bar for my treats. If you want to stretch your batch or simply prefer a thinner bar, spread it into a 9×13-inch rectangular pan instead. I recommend lightly greasing the pan and lining the bottom with parchment paper to make it as easy as possible to pull the bars out before slicing them up to serve. Store any leftovers in an airtight container but they are at their very best within a day or two of making them. Lightly grease a 9×9-inch or 9×13-inch (for thinner bars) baking dish and line the base with parchment paper. In a medium bowl, toss the cereal with ground cinnamon to lightly coat it, then add cereal to the marshmallow mixture along with the salt. Stir with a large spatula until everything is evenly combined. Spoon mixture into prepared pan and spread into an even layer with a spatula. Allow bars to cool to room temperature before slicing.